Glentoran have vowed to continue with their appeal against Glenavon's 4-2 win at the Oval last month despite having their latest plea turned down by the Northern Ireland Football League. A dispute arose over the result as Glenavon player/manager Gary Hamilton scored twice in the game but should actually have been serving a ban. Glenavon were told in writing before the game Hamilton was clear to play. On Wednesday, NIFL said it could not overrule the original IFA verdict. Glentoran had lodged an initial protest on the controversy with the IFA's appeals board and it decided Glenavon could not be stripped of the 8 November victory. The Glens then turned to the NI Football League but they said on Wednesday that the IFA has the ultimate say in disciplinary matters. Responding to Wednesday's NIFL decision, Glentoran said that the were "very shocked and disappointed" by the ruling. The Glentoran statement accused the NIFL of "joining the IFA in attempting to lay a procedural minefield in order to avoid simply applying the rules of the game in this matter. "The IFA clearly stated last week that Gary Hamilton was ineligible for Glenavon's recent league game at the Oval but clearly no one in authority in the game in Northern Ireland is prepared to follow this to its inevitable conclusion. "That conclusion should have been the implementation of the mandatory sanction under the FIFA Disciplinary Code." Glentoran say they have already placed a further appeal with Sports Arbitration UK and that a hearing with take place some time in January. "On a broader issue, today's abdication of responsibility by the NIFL has implications well beyond this single matter," added the Glentoran statement. "Along with our colleagues at the other clubs, Glentoran willingly bought into the concept of the NIFL as a new dawn for league football in Northern Ireland. "It appears that we expected too much as through this ruling the NIFL has clearly demonstrated its subservience to the IFA." 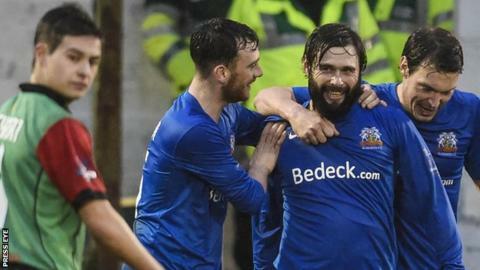 The controversy had arisen after Glenavon player-boss Hamilton played and scored twice at the Oval despite being ordered from the dugout a week earlier. The Irish Football Association's disciplinary body told Glenavon that Hamilton had been sent off as a manager and not as a player. It has now been accepted that was a mistake and Hamilton is to serve a two-match suspension, starting from 15 December.